Offer price excludes VAT at 20%. All units are offered for hire in line with the Andrews Sykes general conditions of sale or hire. Deposits may be required in advance and full payment must be received prior to delivery. Indirect fired heaters are perfectly suited to marquees and have been designed for deployment in indoor areas where there is limited ventilation. 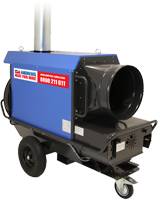 All units within our heater hire fleet deliver huge volumes of dry, safe and fume-free hot air and have been tested in accordance with the highest industry standards. Calculations to determine the correct size of Andrews portable heaters to use are shown below. Determine the temperature rise required inside the space to be heated in °C. Find the volume of the space in cubic metres (i.e. L x W x H in metres). You can access our calculator by clicking here. What type of heater is most appropriate for me? We recommend that you call us on 0800 211 611 so we can help calculate the type and capacity of unit required based on your tent, marquee or gazebo’s specifications. You can also use our Heater Calculator to get an idea of which product might be most suited to your environment. Do you have an emergency out-of-hours service? Yes, you can contact us in an emergency at any time on 0800 211 611. How fast can you get the heaters to me? We deliver to all locations nationwide within four hours of contact. The easiest way to pay is with our credit account facility. Opening an account with us is simple, just give us a call on 0800 211 611. We also accept company payment/purchase cards.